A sound heart is life to the body. 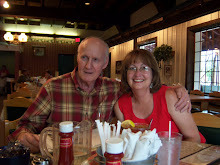 As I write this message, my brother, Woody, is in the hospital after having a heart attack last Friday. He is still in the Intensive Care Unit. We went to visit him yesterday and thankfully found him to be cheerful and laughing easily. He was much improved from the day before. He will probably be taken to another hospital in a few days, depending on the test results. I am so very thankful Woody has a "sound heart". His physical heart is in need of medical attention, but I know he is a Christian and loves the Lord. He is praising the Lord with every beat of his heart. Woody and I only met for the first time in our lives two years ago. By the miracle of God through Allen, my husband, Woody and I have discovered each other after all these years apart. It's a long story; too long to go into detail here, but it is a true love story, nonetheless. We are all so thankful God brought us together. Woody was 19 years old when I was born. He never knew he had a sister until that fateful day when I called his home number and left a message on his phone stating that I truly am his sister. Because of his love of God and mine, when we finally spoke on the phone for the first time, he knew I was his sister. Ours has been a precious and rare love since that time. Yes, he is in the hospital after having a heart attack, but we aren't worried about God's plans and what the future holds regarding his health. Our hearts are sound and so is our faith. Though his heart is weak, his faith is strong. For some, the heart is strong, but the faith is weak. God takes our weakness and strengthens us. How strong is your heart and how strong is your faith. If either is weak, ask God to come into your heart and make you whole and strong enough for each challenge that comes your way. My sister in law called me earlier and shared with me that she called 911 this afternoon to get my brother, Woody to the hospital. As I understand it, he has congestive heart failure. As of a few minutes ago, he was still in the emergency room, but will be taken to the ICU. We all appreciate your prayers. For those of you who have lifted Sharon Lowry and her family in prayers since the discovery of a brain tumor, I want you to know your prayers are being answered. While we currently don't have a lot of details, we do know the biopsy was performed and they are awaiting results. Sharon came home from the hospital on Friday and received visitors yesterday. I baked a pound cake to take to them, bought her a gift and card and Allen and I went by for a brief visit. She looked radiant. Though her ability to speak has been involved, she is able to articulate her thoughts very well. I encourage you to visit the Caringbridge.org site set up for the Lowry family. I have included it in "My Favorite Links" area of my blog. She and Paul want you to know how much they appreciate your prayers. I've heard from some of you that you are praying for them. I thank you, one and all. Prayer is faith in action and faith without action is dead. We can come to the Lord boldly, not with pride and self confidence, but with an overflow of assurance in Him. He is in control of everything that is in existence. Believe that His goodness and graciousness are at work in and through you. Today, February 21st is our son, John's 18th birthday. There are no insignificant birthdays. We may come to the age when we say "I've stopped celebrating birthdays. I don't like getting older." I say "each and every birthday is a reason to celebrate the gift of life God gave us and the gift of the lives of the ones we love." God's love is abundant; God's love is amazing; God's love is absolute! This is the day the Lord has made. We will rejoice and be glad in it!! Today's message is devoted to Sharon and Paul Lowry and family. We know them through John's Boy Scout troop. 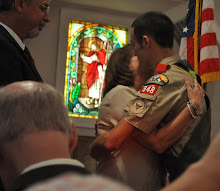 Paul's Godly influence has been instrumental for several years in helping mould John into an Eagle Scout. We owe Paul and Sharon a debt of gratitude we can never repay for their commitment and dedication to scouting. So many boys are becoming better men because of the love and support of Sharon, Paul and their children, James and Mary Beth. Please pray for Sharon and family as they await the results of a biopsy of a brain tumor that was discovered and diagnosed late last week. The biopsy was performed yesterday and she came out of surgery very well. I encourage you to visit http://www.caringbridge.org/visit/sharonlowry . Take time to read their story and visit the journal. Leave them a word of encouragement. They are a very special family rooted and grounded in God's Holy Word and are shining examples of doing more than reading their Bible. They live with God's love in their hearts and share it so freely. What has happened in their lives right now is a testimony of faith in action. From her hospital bed, Sharon is ministering to all of us with her strong spirit. Even when speech was affected and she couldn't talk, she was humming her beloved hymns. One of God's greatest desires is for His people to draw closer to Himself. Through this reality, Sharon and Paul are drawing people closer to God by the way they live and love and are honoring their marriage vows. They are inspiration for us all. Our lives are always changing in one way or another. Sometimes, we have control over the events of our lives. In this case, with Sharon and Paul, they didn't ask for this to happen, but they continue to embrace life amidst the unknowns and remain steadfast in their faith. They have great faith and they are FAITH - Fully Armed Inside Through Him. God honors intercessory prayers. I believe in the power of the prayers of one and I believe in the power of the prayers of many. I'm not worried about Sharon and Paul, because I know God has their lives in His hands and His will and purpose for their lives will be fulfilled. I have faith in God and in Sharon's care providers. What is happening in their lives could happen to any one of us at any time. Don't take your health and love for granted. We can't be worried about the possibilities. We can live with God's love in our hearts every day and embrace life as Sharon and Paul are doing. Got the Gift? Share the Gift. Having now spent more than forty-one years being single, I have learned that it is indeed a gift. Not one I would choose. Not one many women would choose. But we do not choose gifts, remember? We are given them by a divine Giver who knows the end from the beginning, and wants above all else to give us the gift of Himself. God is good even when we don't understand His motives. How can we understand His motives unless He reveals them to us. Last night I sat here at my computer and God gave me a poem to share with you called "All Of Me". In 2005 God gave me this gift of writing poetry. I didn't ask Him to give it to me. I didn't think I was worthy of His gift. I doubted my qualifications to write, because I lacked experience and confidence. God knew the plans He had for me then and He knows the plans He has for me today. When I write a poem and share it with the world, I am giving you all of me in the essence of that poem. In giving me the gift, He expected me to share it with others. Rather than second guess His reasons for giving me His gift, I stepped outside my comfort zone and embraced it. Taking a great leap of faith, my dear friend, Quentin Clingerman, believed in me and believed that my poetry was "good enough" to be published at his wonderful website called wordchimes.com Three of my poems are among other wonderful poems published in a book called Wordchimes.com A Poetry Anthology, which Que compiled himself from poets at Wordchimes. I can't take any credit for the poems in the book or any of my poems for that matter. They all belonged to God before He gave them to me. I say all of this to share this point with you. God chooses our gifts for us. We don't choose them. Ms. Elliot believes singleness is a gift from God. For those reading this message who are single, embrace your singleness as a gift today. Thank God for it, because you truly don't know what the alternative would really be like. God doesn't put more on us than we can bear and there are those who are married today who aren't happy in marriage for whatever reasons. Today, be the best single person you can possibly be. Today, be the best married person you can possibly be. Today, be the best divorced person you can be. Today, be the best widowed person you can be. Did I miss anyone? You get the point, right. Put "all of you" into today. Give "all of you" to God today. Remember, we get out of something what we put into it. Let go and let God do His work in you today. He loves each and every one of us with an undying love. It's all about Him and what pleases Him. He understands our innermost desires. He doesn't love us any less when we feel He doesn't give us the desires of our heart. The fulfillment of the desires of His heart are what matters most. Embrace life today, regardless of your marital status. Don't know what is your gift? God will reveal your gift when He knows you're ready to receive it and share it even when you aren't aware of it yourself. Trust Him. Today is a gift. What will you do with it? It's your choice. Author's note: There will be times I'm sure, and times I'm uncertain. At times, my efforts will be adequate, and at times, my efforts will be inadequate. Through all the times of my life, I owe everything I am and everything I have to God and I am eternally grateful to Him. All of me, the good, the bad and the ugly, all of me, I give to God. He takes the good in me and makes me better. He takes the bad in me and uses it for His purpose. He takes the ugly in me and turns it into beauty. He is truly in the business of performing miracles. Look what he did for me. He took my unworthiness and made me worthy, because He loves me. So much more He will do for you!! Affirmation and appreciation, I believe are two of the things all people want and need. We all want to receive affirmations of faith and to be appreciated. Prime examples are "You are growing stronger every day. You're doing a great job! I'm proud of you and all you have done!" "I really appreciate your help." Valentine's Day is just around the corner. We truly have 364 more days to express affirmations and appreciation to those we love than just this most publicized day of the year. The power of positive intangibles is incredible and changes lives. These intangibles, we take for granted every day, without realizing their awesome power. We must do more than read about them and talk about them. We must exercise them daily in order for their power to be unleashed. Such intangibles are prayer, relaxation, laughter, meditation, listening to beautiful, relaxing music, just to name a few. There is nothing new under the sun. I'm probably not telling you something you haven't heard before. But, sometimes we need to be reminded of the simple truths that have held such power for countless ages. When we've heard sage advice from someone we trust, telling us, "don't worry, it will be alright" or "relax and let it go" or "loosen up and laugh a little", maybe we should take their advice and "just do it". We have power inside of us. When we pray, let's ask God to prepare us to unleash the power within, believing there really is power within, and believe He will do just that. Then, we can put that power into action. Funny thing, it doesn't cost a dime. All it takes is our time, effort and believing, first in God, and in ourselves. Another funny thing, this power is as close as our own breath 24/7. Friends, today is truly once in a lifetime. Today will never happen again. Don't waste one minute of it. Use it for God's glory and honor Him in everything you say and do. It is a privilege to live and breathe on this planet today. If you're single, be glad and encourage someone here on earth today. If you're married, be glad and encourage someone here on earth today. If you're divorced, be glad and encourage someone here on earth today. If your spouse has already passed on, be glad and encourage someone here on earth today. If you're sick, be glad and encourage someone here on earth today. You ask, "How can I be glad in my singleness? I want to be married?" You ask, "How can I be glad I'm married? My spouse doesn't......"
You ask, "How can I be glad I'm divorced? My life is......."
You ask, "How can I be glad I'm a widow or widower? My soulmate is......"
You ask, "How can I be glad I'm sick? I feel like ......."
With each and every one of you, I empathize. Our own (perceived) problems are diminished when we show compassion and concern for others. Sometimes we focus so long and so fervently on our own issues we tend to forget the plight of others. God loves us and speaks to us in so many ways. Sometimes, He speaks to us through the words of others. Ask Him to speak to someone through you today. You won't have to worry about what to say. God will direct your words as you encourage someone who needs to hear a good word. We all need encouragement. Not one of us is truly independent or self-sufficient. We all need God. We all need each other. Someone needs you to be there in a special way today. Today....once in a lifetime opportunities await you. "It is finished". Translated, this is the definition of the Greek word tetelestai. "It" refers to Jesus' mission here on Earth. Our (mankind) sin debt has been paid in full. When Jesus hung on the cross and uttered his last breath, this was what He said. Why, then are we continuing to think we have to pay the price. Jesus already paid it. Because of our human nature, we have sinned, we sin, and we will sin. Humbly coming before God, asking for forgiveness of our sins and shortcomings, He forgives us and remembers the sins no more. When we pay a debt in full, we file away the receipt and rejoice in the moment, then we forget the debt was ever owed in the first place. That's exactly what I want you to do now. Acknowledge to God that Jesus paid the ultimate price for a sin sick world, not merely filing away the receipt, but destroying it and rejoice with Him in the victory. Believe God has truly forgiven you and let go of the past. God's power is beyond our wildest imagination. Because He loves you, He gives you power. Use the power He has bestowed upon you. It's in there, inside of you, waiting to be used for God's glory. Stop trying to trust Him; simply trust Him. Stop trying to believe in Him; simply believe in Him.